Ethiopian Airlines CEO Tewolde GebreMariam at the scene of the crash. Black box data from last weekend's Ethiopian Airlines plane crash has indicated "clear similarities" with October's Lion Air jet crash. The MAX 8 crashed shortly after takeoff, killing everybody on board. Ethiopia's transport minister said on Sunday that flight recorder data indicated "clear similarities" exist between last week's Ethiopian Airlines plane crash and the downing of a Lion Air plane in October. Dagmawit Moges told reporters the parallels will be the "subject of further study during the investigation." Both crashes involved the same model of plane - Boeing's 737 MAX 8 - and both pilots reported flight control issues, causing aviation authorities to ground the model around the world. 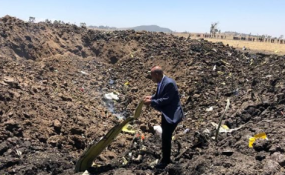 France's Bureau of Enquiry and Analysis for Civil Aviation Safety (BEA) is working with US and Ethiopian investigators to determine what brought down the plane. Thousands of Ethiopians gathered at the capital's Holy Trinity Cathedral on Sunday for a funeral mass to honor the victims. Flight ET 302 came down near the town of Bishoftu, or Debre Zeit, about 50 kilometers (31 miles) south of Addis Ababa, just minutes after taking off, killing all 157 people on board. People from 35 countries were on the flight. The country's transport minister said detailed information based on flight data, along with a preliminary report into the crash, will be released within the month.